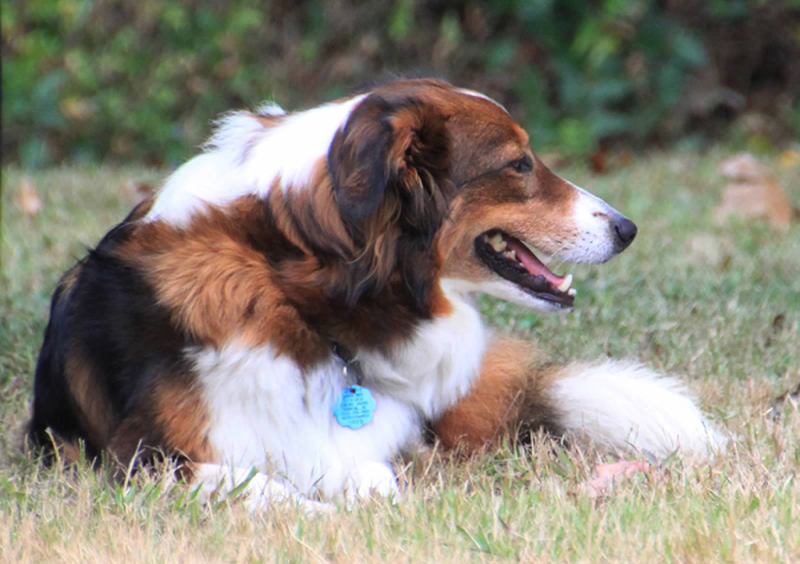 Description: Zeke is a shaded sable and white English Shepherd that is four years of age. He has a very calm and loving disposition. While he is comfortable as a pet companion, he also displays good working instincts and will work stock when asked. He has a loose eye and upright approach choosing in most cases to use bark rather than bite to enforce the rules. His limited experience is mostly with cattle and poultry. He is very biddable especially when one-on-one with his master. He is energetic and a very fast runner. Displaying some guardian instinct, he will stand his ground with other animals in his domain. He is alert and will bark as a warning when something is out of order but not incessantly. Overall, he is a lover and a pleaser. Dam: Wingler's White Oak Holiday "Holly"
She is quick and responsive when training for agility or just playing ball at home. Since her daddy has retired from agility, she is my main partner and has earned her AGI & AGII agility titles and is 13 points away from earning her UACH. She has a super temperament & possesses the good sense know how to help enforce the “good” rules at our house. Always alerts to strangers, roaming animals, snakes and predatory birds, plus is a great varmint eradicator. She has proven herself to be a great mom with her previous litters. Litter due February 20, 2018. For Holly's final litter, we went back to Zeke, who sired her 2016 litter. I kept a puppy off of that litter & have been able to watch Roper as she has been growing up. I was very pleased with that litter while they were here & feel that Roper is a good representative of the breed. I would like to see some of these pups in working homes with the option of keeping some of them intact. Puppies should all be some form of shaded sable. In the last litter there were only 3 pups, but each was a different shade of sable. Updates on website. Did you own ES before starting your breeding program? If so, for how long? Yes. My family has owned English Shepherds most of my life. I grew up with them as family pets. My grandfather also raised them.